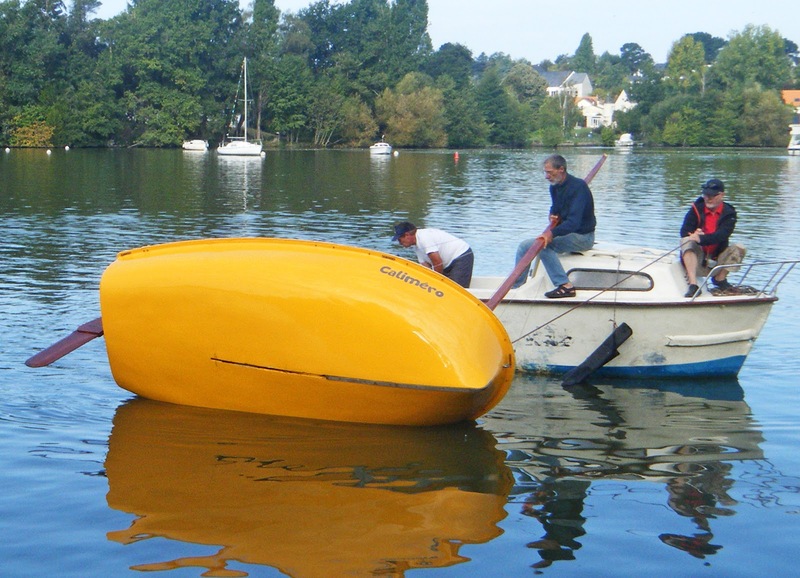 Blog post on the original French Moth get together, the 2001 Moth design competition sponsored by the French magazine "Le Chasse Marée". 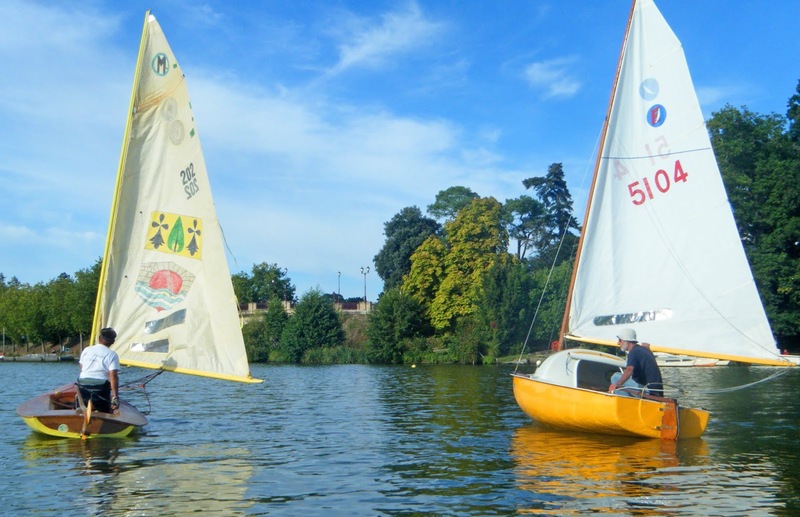 To celebrate the 90th birthday of the Moth class, seven very different Classic Moths of the French section gathered at Sucé-sur-Erdre, mid September, for a congenial get-together. Though racing was not the central reason for this rendezvous, there was some racing in very light air. Sucé-sur-Erdre is about 15 km north of the city of Nantes. Nantes is considered the traditional center of Mothboating in France as it was there that 150 of the Nantais Moth were built during World War II. Bertrand Warion sent along a report and photos and I poached some photos from David Balkwill (who I think is an English expat living in France) that were posted on Facebook. Bertrand Warion stumbled upon this Moth as a shell in Switzerland twelve years ago. She is a version of the Swiss Dunand design. The hull is glass and Bertrand got her back on the water with some new wooden decks and a Europe Dinghy rig. 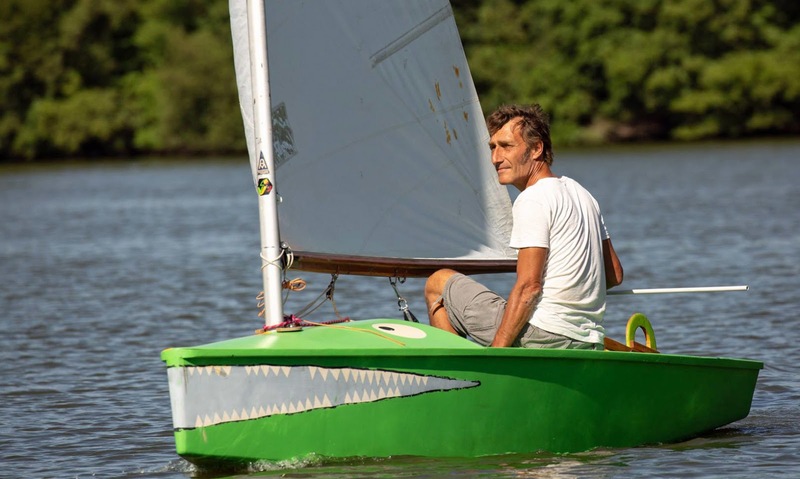 Calimero, owned by Jean-Jacques Cadoret, is a French cruising Moth from the 1960's; a "Moth Béarnais de Camping". George did this blogpost on the history of the French camping Moth. Lots of package in a small form, I can see this Moth being an ideal weekend gunkholer for river exploring. Crocodile is flat bottomed Moth, designed and built by Charentais Olivier about five years ago. You need some flat, wide sections to make the "Moth Béarnais de Camping" work. You can see the metal keelband up forward to protect the hull on beach landings and the use of a centerboard. The Moth owned by Jean-Yves. Named Felix, he built this Moth when he was 12 years old. It was designed by his father and from this shot shows some relationship to the British Moth. 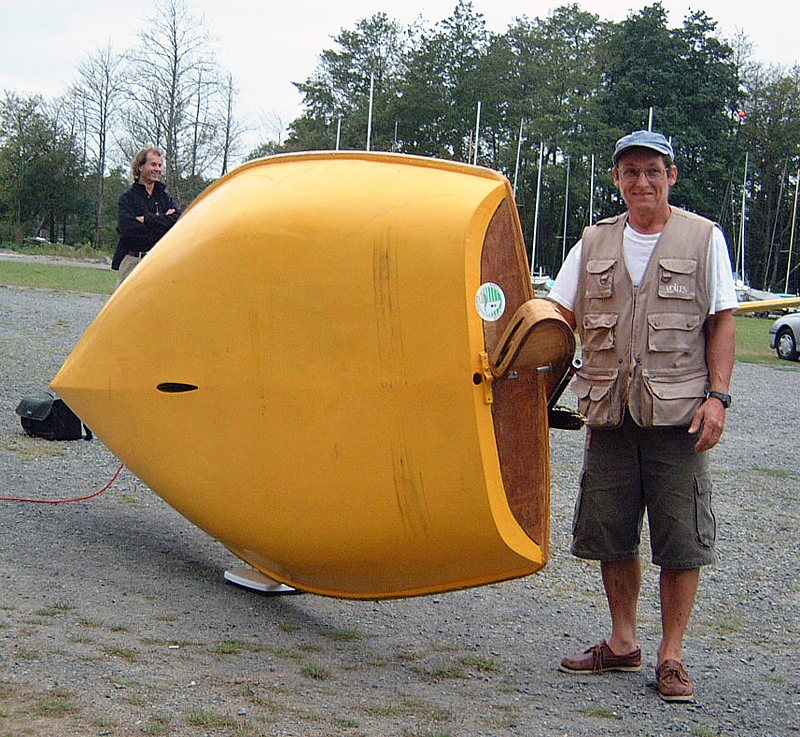 On the left is Julia, a Moth designed and built by Didier Leveille for the 2001 Moth design competition, sponsored by nautical magazine, "Le Chasse Marée". On the right is Calimero, the cruising Moth. Julia at speed (most likely the fastest she went during the mostly windless weekend). Didier designed Julia somewhat after the Laser with flat sections throughout. I do like the artistic sail logos. I'll have to find out what they mean. A photo of Julia's sections here. Launching. Jean-Yves in number 131. Bertrand Warion's red deep-V design is being remarkably docile. Usually these Moths flip right over when left unattended. "My experience sailing the Nantais Nola was astonishing. I've sailed Moths, both British and International, since the seventies, but this one from 1941 was by far the most uncomfortable. We had very light winds, but after three days on the water I was covered in bruises from all the corners and edges I was squeezed up against; in conditions where you can't move or you stop the boat! 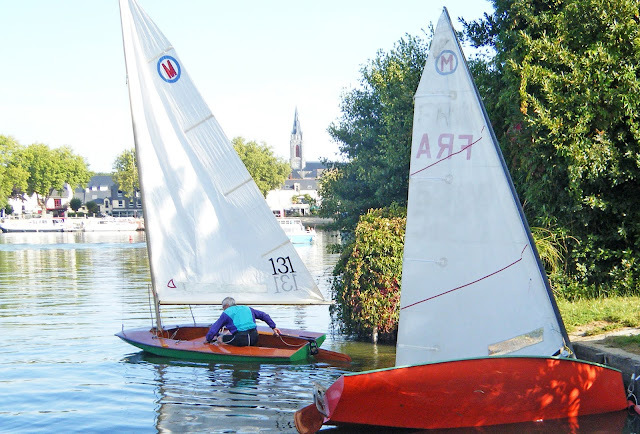 Let's close this blog post with the most popular Classic Moth, Frédérique Larrarté with her ubiquitous Europe dinghy. Yes, we had a nice week-end to celebrate the birthday. I would like to correct the photo credits since the ones that I had posted on Facebook were taken by Philippe Meunier, and the girl sailing the Europe is Frédérique Larrarté. My experience sailing the Nantais Nola was astonishing. I've sailed Moths both British and International since the seventies, but this one from 1941 was by far the most uncomfortable. We had very light winds, but after three days on the water I was covered in bruises from all the corners and edges I was squeezed up against in conditions where you can't move or you stop the boat ! Looking forward to 2028. We must have an enormous party. Thanks for filling in the details. I've made the changes you've pointed out. 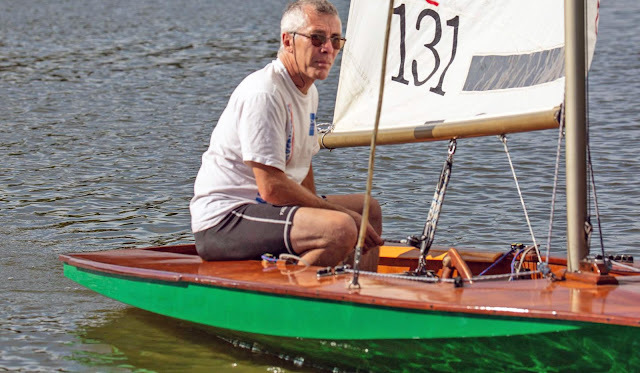 I haven't sailed a Vintage myself but my friend John Z just picked one up so I think I'll be trying her out shortly. What's the deal on the striped costume. Was that period sailing wear? If so, what period? Also what's the background on Didier Leveille. Was that his property you sailed out of? Bertrand Warion's Swiss Moth: A Dunand Variant? Do you know your way to Pondicherry?